Our guides show you their city. 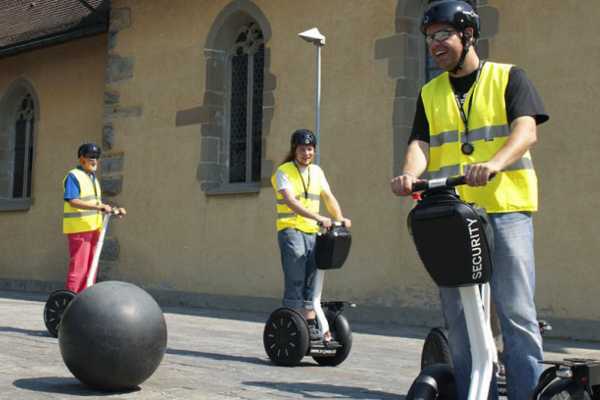 Come with us on an interesting and unforgettable tour of the picturesque old town of Basel with the innovative Segway! Our route takes us from the Messeplatz to Kleinbasel, which lies on the left bank of the Rhine. Originally founded as a city in the early 13th Century, Kleinbasel had close economic ties to Grossbasel but the two areas were not officially merged until 1392. We cross the Rhine over the Middle Bridge, which is built entirely of stone and is an important part of Basel’s history. It is the oldest existing means of passage over the Rhine between Lake Constance and the North Sea and since the 14th Century, has been an integral part of bringing economic success to the city. After crossing the Middle Bridge we reach the left Rhine area of Basel. We continue alongside the beautiful Rhine with its impressive scenery as backdrop, to St Johanns-Tor, one of three former city gates that still stands within the old city walls. Our return path takes us to the Spalentor, the university grounds and the botanical gardens. The historic and awe-inspiring Rathaus stands on the bustling Marktplatz. Today it is still the seat of government of the Canton and City of Basel. As our last stop in the old town, we drive to Barfüsserplatz with the famous Tinguely Fountain and on to take in the sight of the imposing Münster. We return over the Middle Bridge to Kleinbasel and drive past the Municipal Orphanage, which at one time was the last established monastery in Basel. Our 2.5 hour tour ends at our starting point, the Messeplatz. Our Service Tours are accompanied by experienced and friendly Segway Citytour Guides Small groups with a maximum of 6 participants per guide Picture Service: Our Citytour guides take pictures with your camera if desired 1 Segway per participant Authorized Segway Tour Operator by Segway USA Introduction to the vehicle, comprehensive safety instructions as well as driving training for safe handling Helmet and high visibility vest Interesting facts about the destination Appropriate speed to allow understanding of tour guide Refund of 50% when cancelling after safety instructions Environmentally friendly city tour with electric vehicles without traffic noise Conditions of participation Please note the Segway PT is classified as a small motorbike in Switzerland. No driver’s license is required from 16 years. A driver’s license of the category M (motorbike) is required for participants between 14 and 16 years. There is a minimum weight of 45 kg and a maximum weight of 120 kg for each participant. Previous consumption of alcohol, drugs or strong medication is not allowed. If one or more rules are ignored participants can be excluded from the tour. This tour takes place with a minimum number of 2 participants. Our guides show you their city. 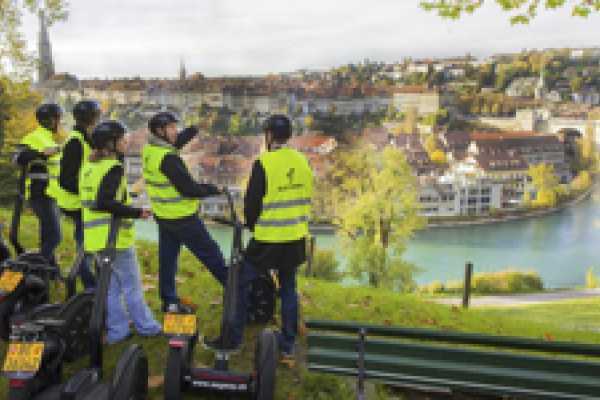 Come with us on an interesting and unforgettable tour through the old town of Berne with the innovative Segway! Our route takes us from the Casino Parking to the Bundesplatz and on over the Kirchenfeldbridge to the Marzilibahn, the second shortest cable way in the world, and the Mattequartier, which lies directly on the banks of the Aare River. For a long period of time, this was the only crossing point over the Aare and thanks to its beneficial location, the shipping pier and public baths were established. Even the famous Casanova was a guest here. Following our visit at the Mattequartier, we stop at the spacious new Bärenpark where we have a clear view of Björk and Finn, the living landmarks of Bern. At the idyllically situated Rose Garden, frequented by locals and tourists alike, we experience the world famous sight of the roofs of the UNESCO World Heritage listed old city of Bern. We continue our journey to the Breitenrain-quartier, where we show you the secret accommodation of the pope on his travels to Switzerland. On our return drive to the casino we pass the popular Zytglogge and the Münsterplatz with the dominating late gothic Münster, the foundation stone of which was laid in the early 15th Century. The tour ends in 2.5 hours at our starting point, the Casino Parking. Our Service Tours are accompanied by experienced and friendly Segway Citytour Guides Small groups with a maximum of 6 participants per guide Picture Service: Our Citytour guides take pictures with your camera if desired 1 Segway per participant Authorized Segway Tour Operator by Segway USA Introduction to the vehicle, comprehensive safety instructions as well as driving training for safe handling Helmet and high visibility vest Interesting facts about the destination Appropriate speed to allow understanding of tour guide Refund of 50% when cancelling after safety instructions Environmentally friendly city tour with electric vehicles without traffic noise Conditions of participation Please note the Segway PT is classified as a small motorbike in Switzerland. No driver’s license is required from 16 years. A driver’s license of the category M (motorbike) is required for participants between 14 and 16 years. There is a minimum weight of 45 kg and a maximum weight of 120 kg for each participant. Previous consumption of alcohol, drugs or strong medication is not allowed. If one or more rules are ignored participants can be excluded from the tour. This tour takes place with a minimum number of 2 participants. Our guides show you their city. Come with us on an interesting and unforgettable tour through Interlaken and the surrounding area with the innovative Segway! Our tour begins at the City Hotel Oberland and passes over the emerald green waters of the Aare River into the picturesque old town of Unterseen, whose roots date back to the late 13th Century. Here we have a fabulous view of the mountain scenery of the Eiger, Mönch and Jungfrau. We continue along the Lombach River until we arrive at the well-known Neuhaus, where the Lombach flows into the Lake of Thun. At Neuhaus we enjoy the perfect combination of water and mountain worlds in an idyllic setting. As the tour continues we stop at the the Weissenau ruin, a former castle built at the edge of the lake. We cross the Aare River once more, pass the Interlaken West train station and go on through the Wagneren canyon. Here we can test our mastery of Segway driving and experience the capabilities of the Segway PT that carries us up a lengthy ascent with undiminished speed. Other sights along the way include the Rugenbräu Brewery, the amazing Unspunnen ruin and the village center of Wilderswil. We drive across the RUAG Airport to Bönigen and the Lake of Brienz with its one of a kind enchanting clear blue-green water. The end of our varied tour includes the Interlaken Castle, the Japanese Friendship Gardens and the Höhematte in the center of town. We arrive back at our starting point in a total of 2.5 hours. Our Service Tours are accompanied by experienced and friendly Segway Citytour Guides Small groups with a maximum of 6 participants per guide Picture Service: Our Citytour guides take pictures with your camera if desired 1 Segway per participant Authorized Segway Tour Operator by Segway USA Introduction to the vehicle, comprehensive safety instructions as well as driving training for safe handling Helmet and high visibility vest Interesting facts about the destination Appropriate speed to allow understanding of tour guide Refund of 50% when cancelling after safety instructions Environmentally friendly city tour with electric vehicles without traffic noise Conditions of participation Please note the Segway PT is classified as a small motorbike in Switzerland. No driver’s license is required from 16 years. A driver’s license of the category M (motorbike) is required for participants between 14 and 16 years. There is a minimum weight of 45 kg and a maximum weight of 120 kg for each participant. Previous consumption of alcohol, drugs or strong medication is not allowed. If one or more rules are ignored participanta can be excluded from the tour. This tour takes place with a minimum number of 2 participants. Classic-Tour Lausanne "Lake to Sky"
Our guides show you their city. 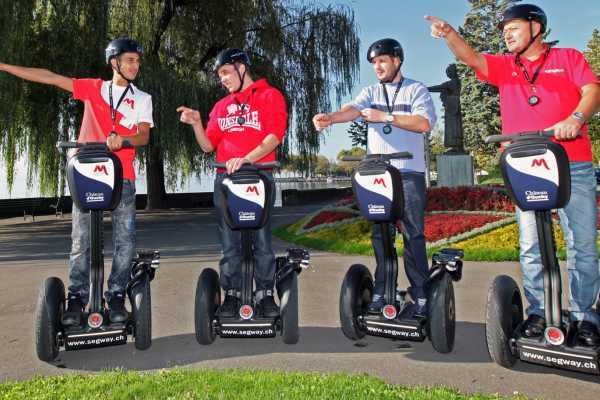 Come with us on an interesting and unforgettable tour through Lausanne with the innovative Segway! Our route begins at the Hotel Le Château d’Ouchy and first takes us along the Quai d’Ouchy with its stunning flower arrangements, to the Haldimand Tower, built in 1823 as imitation romantic ruins. We climb gently along the back path of the Park du Denantou via la Croix d’Ouchy and past the metro station Delices to the Hill la Cité. We cross the railway tracks in the direction of Esplanade de Montbenon, where the Casino and the imposing Justice Palace can be admired. From this location we have an impressive view over Lake Geneva. As we continue we reach the new entertainment district of Le Flon and drive to the Notre Dame Cathedral, where the call of the watchers has been ringing out once an hour, every night for the last 600 years. Following this we reach the Castle St Maire, the seat of the Vaud government, and the highest point on our route. The tour continues through the lively Place de la Riponne with the Cantonal Museum of Fine Arts and over the Place and Pont Chauderon. We travel through a series of picturesque alleyways before reaching the banks of the lake in Vidy. After a visit to the Port de Vidy and the Cantonal Esplanade, the location of Expo 64, we drive along the Avenue de Rhodanie to our starting point, where the tour ends after 2.5 hours. Our Service Tours are accompanied by experienced and friendly Segway Citytour Guides Small groups with a maximum of 6 participants per guide Picture Service: Our Citytour guides take pictures with your camera if desired 1 Segway per participant Authorized Segway Tour Operator by Segway USA Introduction to the vehicle, comprehensive safety instructions as well as driving training for safe handling Helmet and high visibility vest Interesting facts about the destination Appropriate speed to allow understanding of tour guide Refund of 50% when cancelling after safety instructions Environmentally friendly city tour with electric vehicles without traffic noise Conditions of participation A valid drivers licence is required (motorbike category A or A1, 50ccm). If the Swiss drivers licence for cars is obtained before 2003, category A 1 is automatically included. The minimum age is 16 years. There is a minimum weight of 45 kg and a maximum weight of 120 kg for each participant. Previous consumption of alcohol, drugs or strong medication is not allowed. If one or more rules are ignored participanta can be excluded from the tour. This tour takes place with a minimum number of 2 participants. Our guides show you their city. 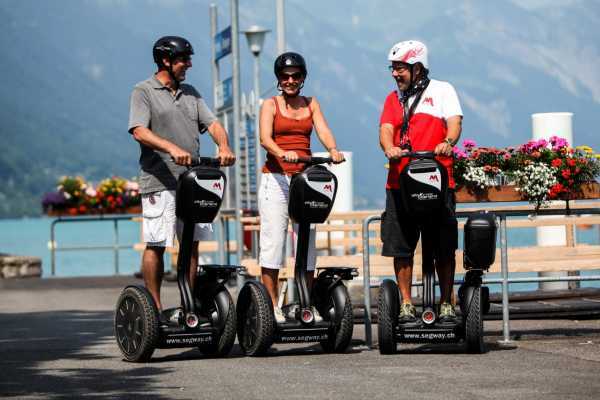 Come with us on an interesting and unforgettable tour through Lucerne with the innovative Segway! Our route takes us from the Radisson Blu Hotel to Gütsch, where we enjoy our first fabulous glimpse of the city and onwards over the St Karli Bridge. We pass the Museggmauer, which, with its nine towers, is a historical city fortification. We continue on to see the world famous monument of the dying Lion of Lucerne, which was carved into the rock in the former sandstone quarry in 1821. After this, we enjoy the ease of driving the winding Wesemlinquartier - tailor made for the Segway. At the incline to Dietschiberg in the north-eastern part of the city, we see both local mountains, Rigi and Pilatus. Once on the Dietschiberg we enjoy a spectacular view over the picturesque skyline of the city of Lucerne. We move on to see the Kapell Bridge, the landmark of Lucerne and the oldest covered wooden bridge in the world. The adjoining water tower was built in the 14th Century before the construction of the bridge. It was originally used for archive storage, strongroom and torture chamber and is today one of the most photographed monuments in Switzerland. While we're here, we take a look at the nearby Jesuit Church. We pass by the Cultural- and Congress Center of Luzern and return to our starting point where our tour finishes after 2.5 hours. Our Service Tours are accompanied by experienced and friendly Segway Citytour Guides Small groups with a maximum of 6 participants per guide Picture Service: Our Citytour guides take pictures with your camera if desired 1 Segway per participant Authorized Segway Tour Operator by Segway USA Introduction to the vehicle, comprehensive safety instructions as well as driving training for safe handling Helmet and high visibility vest Interesting facts about the destination Appropriate speed to allow understanding of tour guide Refund of 50% when cancelling after safety instructions Environmentally friendly city tour with electric vehicles without traffic noise Conditions of participation Please note the Segway PT is classified as a small motorbike in Switzerland. No driver’s license is required from 16 years. A driver’s license of the category M (motorbike) is required for participants between 14 and 16 years. There is a minimum weight of 45 kg and a maximum weight of 120 kg for each participant. Previous consumption of alcohol, drugs or strong medication is not allowed. If one or more rules are ignored participanta can be excluded from the tour. This tour takes place with a minimum number of 2 participants. Classic-Tour Zurich "Best of Zürich"
Our guides show you their city. 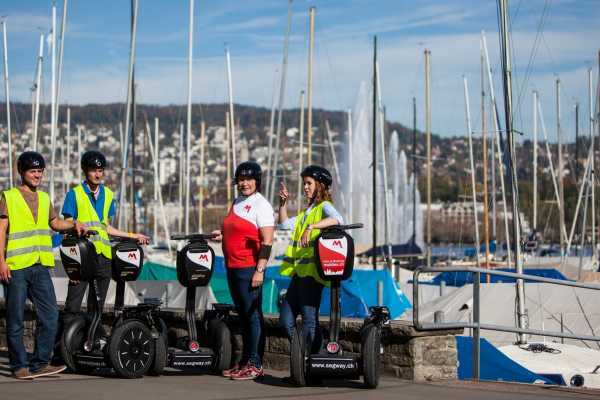 Come with us on an interesting and unforgettable tour of Zürich with the innovative Segway! The tour begins at the Renaissance „Zürich Tower Hotel“ in the trendy Züri West district (Kreis 5). From there we cross the Limmat to Unteren Letten and drive along the water’s edge to the popular river baths of Oberer Letten. Here locals and tourists alike enjoy swimming in the middle of the river in the summer months. We learn the varied history of the Platzspitz in the heart of Zürich and see the Swiss State Museum. From here we roll past the main train station to Limmatquai and the old town and on to Niederdorf, colloquially and lovingly known as Niederdörfli. We continue our drive to Predigerplatz to see the astounding church of the same name. From here we cross the Limmat at the Urania Bridge, pass the operations centre of the municipal police and reach the Lindenhofstrasse where we enjoy fantastic views of the university and the Urania Observatory. Continuing our tour we cross the Bahnhofstrasse, pass the Paradeplatz and drive to the Bürkliplatz, from where we enjoy beautiful views over the lake and on to the old town, the heart of Zürich. After a short visit to the Fraumünster, another of Zürich’s important landmarks we drive on to the Bahnhofstrasse. This shopping street is famous for its expensive boutiques, clock shops and luxury hotels and is the center of Swiss banking. We begin our return journey past the Gessnerallee Theater house, the former indoor horse riding arena and the symbol of free creative theatre and dance. We drive to Alte Kaserne and continue along Langstrasse until we arrive back at our starting point, the Renaissance „Zürich Tower Hotel“, where the tour ends after 2.5 hours. Our Service Tours are accompanied by experienced and friendly Segway Citytour Guides Small groups with a maximum of 6 participants per guide Picture Service: Our Citytour guides take pictures with your camera if desired 1 Segway per participant Authorized Segway Tour Operator by Segway USA Introduction to the vehicle, comprehensive safety instructions as well as driving training for safe handling Helmet and high visibility vest Interesting facts about the destination Appropriate speed to allow understanding of tour guide Refund of 50% when cancelling after safety instructions Environmentally friendly city tour with electric vehicles without traffic noise Conditions of participation Please note the Segway PT is classified as a small motorbike in Switzerland. No driver’s license is required from 16 years. A driver’s license of the category M (motorbike) is required for participants between 14 and 16 years. There is a minimum weight of 45 kg and a maximum weight of 120 kg for each participant. Previous consumption of alcohol, drugs or strong medication is not allowed. If one or more rules are ignored participanta can be excluded from the tour. This tour takes place with a minimum number of 2 participants. Experience Zürich North and the largest Swiss airport from a totally different perspective. 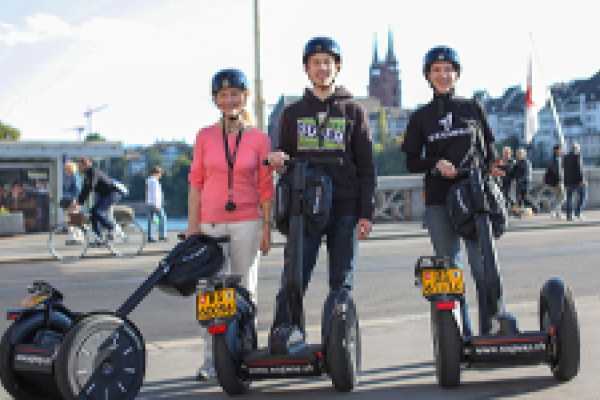 Come with us on an unforgettable and interesting tour with the innovative Segway PT! This unique tour starts at the Swissôtel Zürich-Oerlikon and takes us first of all to the centre of Oerlikon. We show you the most beautiful parks and the most interesting buildings such as the Hallenstadion, Messe and Offene Rennbahn which form an impressive scenery. We reach the airport Zürich after a short drive through Opfikon and Glattbrugg. 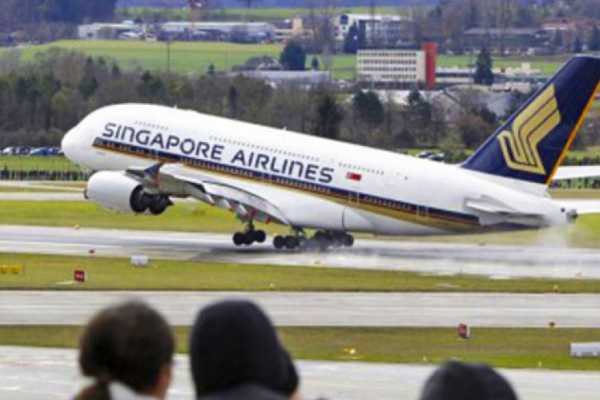 At our first stop at the end of the Runway 16/34 we are wowed by the firsthand experience of takeoffs and landings of Airbusses, Boeings and other airplanes. Afterwards, we drive along the airport to the Heliport whilst receiving information from our guide about airport operations using radio transmission. Get enthralled by our aviation experts as well as the combination of the innovative Segway PT technology and close aeronautics! Our return journey leads us to a small elevation close to the airport from where we enjoy the magnificent view of the extensive airfield. From here we drive to Seebach and back to the Swissôtel Zürich-Oerlikon where this tour ends after 2.5 hours. Our Service Tours are accompanied by experienced and friendly Segway Citytour Guides Small groups with a maximum of 6 participants per guide Picture Service: Our Citytour guides take pictures with your camera if desired 1 Segway per participant Authorized Segway Tour Operator by Segway USA Introduction to the vehicle, comprehensive safety instructions as well as driving training for safe handling Helmet and high visibility vest Interesting facts about the destination Appropriate speed to allow understanding of tour guide Refund of 50% when cancelling after safety instructions Environmentally friendly city tour with electric vehicles without traffic noise Conditions of participation Please note the Segway PT is classified as a small motorbike in Switzerland. No driver’s license is required from 16 years. A driver’s license of the category M (motorbike) is required for participants between 14 and 16 years. There is a minimum weight of 45 kg and a maximum weight of 120 kg for each participant. Previous consumption of alcohol, drugs or strong medication is not allowed. If one or more rules are ignored participanta can be excluded from the tour. This tour takes place with a minimum number of 2 participants.